Join the gang at Manufacture New York in Brooklyn next week for a two-day symposium on natural fibers, local textile production, and sustainability in fashion. The program is a whirlwind of activities, including fiber-processing, dyeing, and felting workshops and a panel discussion featuring some of the industry’s leading authorities: Author and educator Sass Brown, Parsons The New School for Design’s Timo Rissanen, designer Daniel Silverstein, and artist-designer Mimi Prober. 850 Third Avenue, 7th Flr. Tickets are $60 for a one-day pass and $100 for two days if you order before Sept. 22, and $65 and $115 after that. Students can get a 15 percent discount with the code STUDENTF2F. Panelists: Sass Brown (ecofashiontalk.com, The Fashion Institute of Technology), Timo Rissanen (Parsons The New School for Design) Daniel Silverstein, and Mimi Prober. 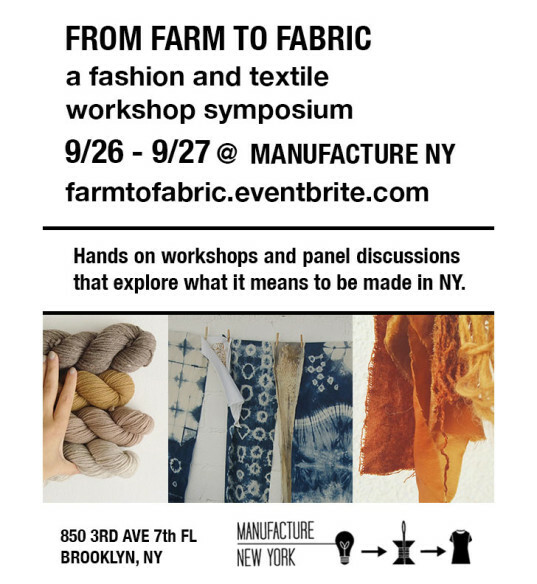 Join the gang at Manufacture New York in Brooklyn next week for a two-day symposium on natural fibers, local textile production, and sustainability in fashion. The program is a whirlwind of activities, including fiber-processing, dyeing, and felting workshops and a panel discussion featuring some of the industry's leading authorities: Author and educator Sass Brown, Parsons The New School for Design's Timo Rissanen, designer Daniel Silverstein, and artist-designer Mimi Prober.